Time for another edition of our Recipes from the Archives blog series – week’s dish is Gail Gibson’s “Better than the M&M’s Pimento Cheese” from Great Expectations: The Davidson College 1990-1991 Office Support Staff Cookbook. The cover of Great Expectations: The Davidson College 1990-1991 Office Support Staff Cookbook. 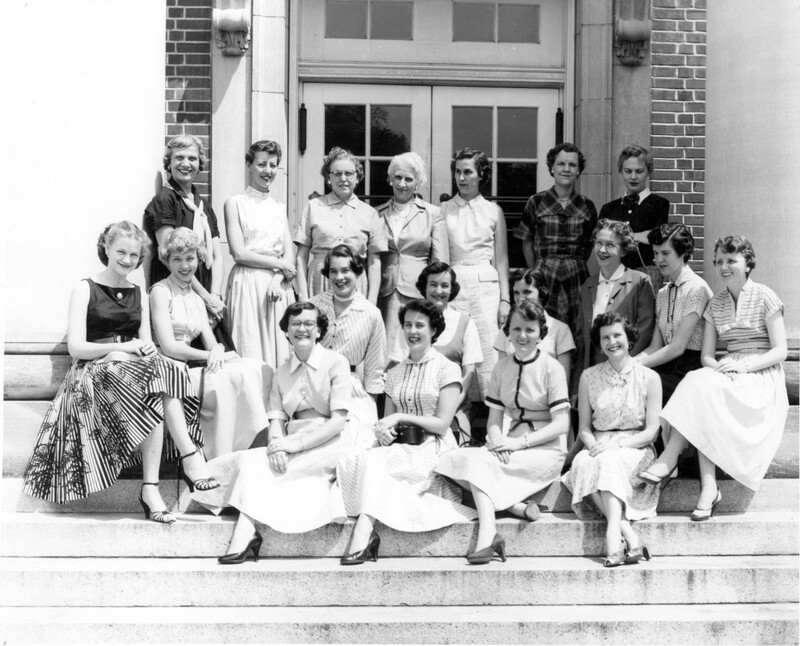 The caption on this photo reads: “The original Chambermaids.” Taken in 1955, this picture includes: Kathryn Halliburton, Kathy (Kitty) Wilson, Della Shore, Mildred Little, Sally Wilson, Nan Lingle, Betty Wally, Peggy Cashion, Page Huckabee, Blanche Parker, A. Wilson, C. Bordeaux, B. Brooks, Joyce Fleagle, H. Allen, Loyce Chaney, and Florede Meetze. 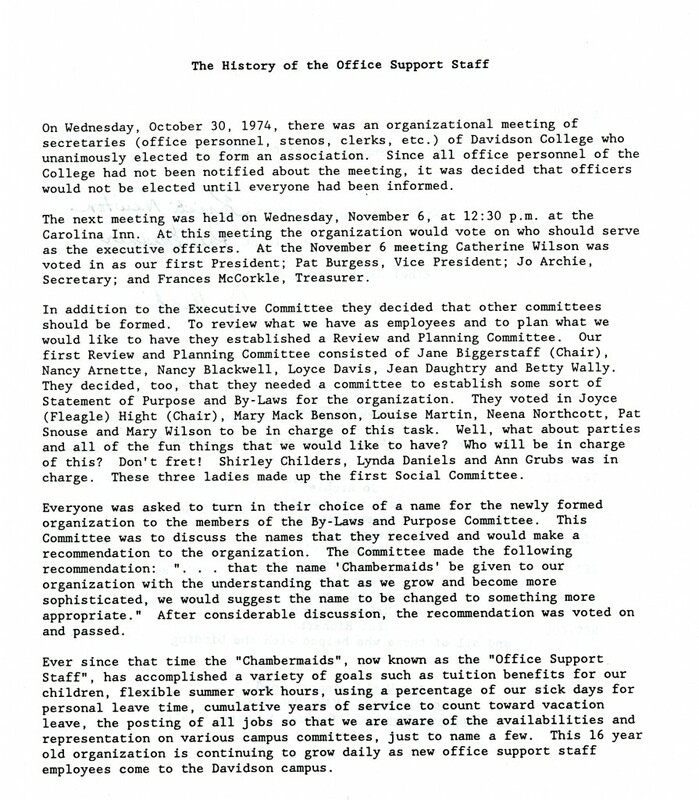 In 1982, The Chambermaids changed their organization name to Office Support Staff. At the time that the Great Expectations cookbook was produced as a fund-raiser, the organization officers were: Kristi Newton (President), Pat Gardner (Vice-President), Ethel Black (Secretary), and Jo Archie (Treasurer). The front page of the cookbook provides a history of the Office Support Staff, including the major achievements of the group: “Ever since that time the ‘Chambermaids’, now known as the ‘Office Support Staff’, has accomplished a variety of goals such as tuition benefits for our children, flexible summer work hours, using a percentage of our sick days for personal leave time, cumulative years of service to count towards vacation leave, the posting of all jobs so that we are aware of the availabilities and representation on various campus committees, just to name a few.” The Office Support Staff ceased meeting as an organization in 2009. 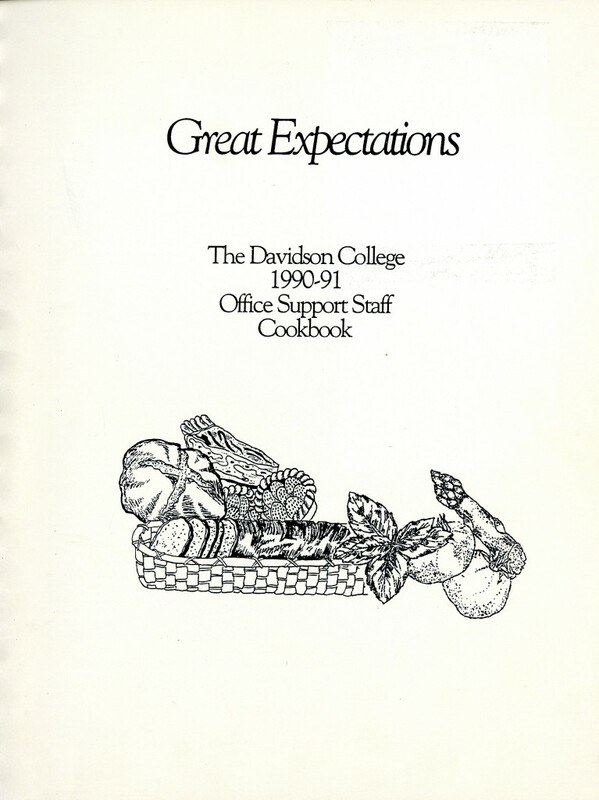 The front page of Great Expectations: The Davidson College 1990-1991 Office Support Staff Cookbook. 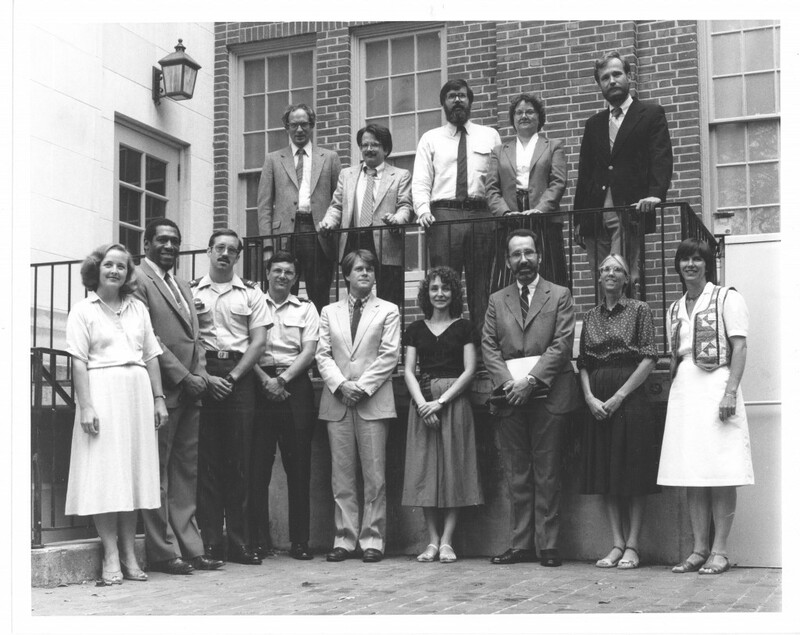 A photo of all new faculty for the 1983-84 academic year – Gail Gibson is on the far left of the front row. Gibson’s statement on the cultural import of food is particularly apropos as we look at her recipe for pimento cheese, a beloved Southern classic. Pimento cheese, as Scott Huler puts it in his story on the history of the food in Our State magazine, is a “Southern, rural, working-class icon — Carolina caviar, some call it” with a fascinating backstory. As a North Carolina transplant, I was particularly interested in having a go at making this cultural staple for the first time. 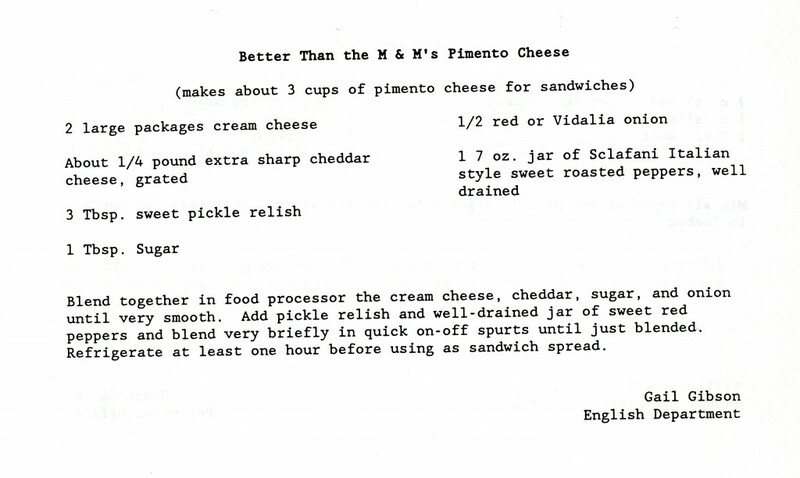 Gail Gibson’s “Better Than the M&M’s Pimento Cheese” recipe, from the Office Support Staff Great Expectations cookbook. 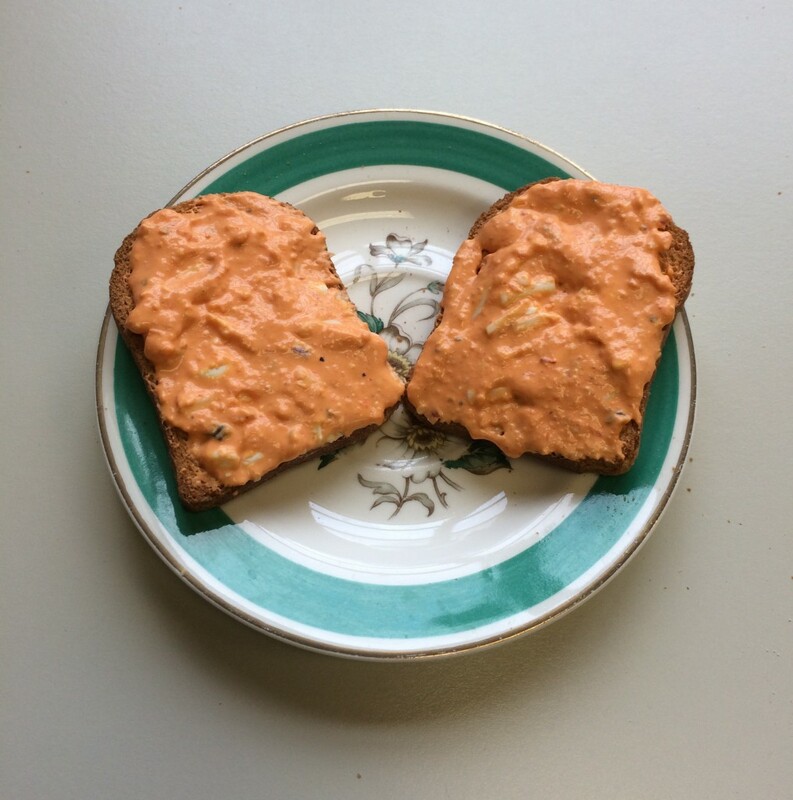 Gibson’s take on pimento cheese is notable for the absence of mayonnaise, usually considered a key ingredient. The title, “Better than M&M’s Pimento Cheese” refers to what today’s Davidsonians just know as the Soda Shop. 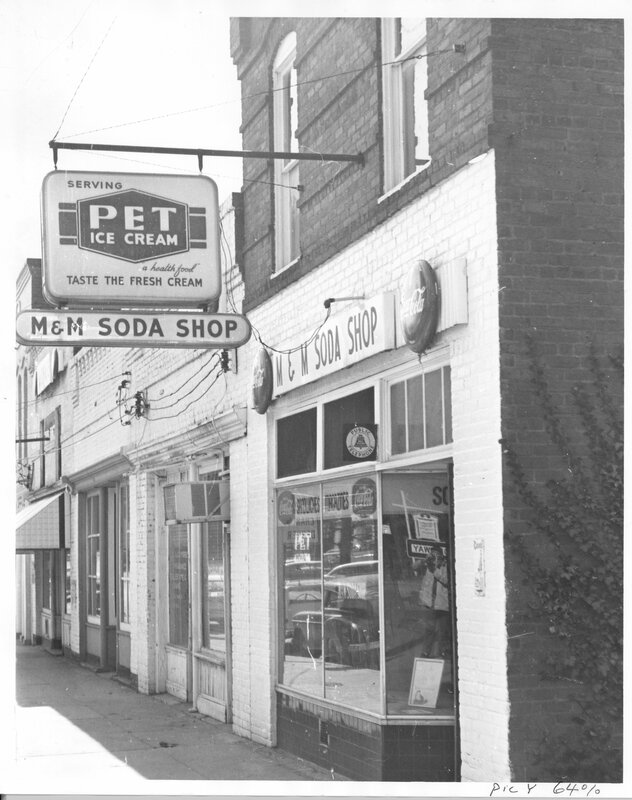 Opened in 1951 by Mary Potts and Murray Fleming (the two “M’s” in the name of the business), M&M Soda Shop has been a town staple ever since. Potts sold the business in 1985, but many of her original recipes remain popular menu items, including their pimento cheese. A picture of M&M Soda Shop on Main Street, date unknown. Gibson’s recipe title is a playful homage to the popularity of M&M’s pimento cheese, suggesting this recipe is even better. I had a little bit of trouble making the recipe – the cream cheese did not easily combine with the other ingredients, and required a bit of milk to thin it out. I also ended up adding more grated cheese than the recipe called for, since once I had completed mixing the ingredients, the orange mixture seemed too smooth. Having never tasted the original M&M’s pimento cheese, I can’t say for sure that this recipe is better… but it is delicious! The finished product, on toast!